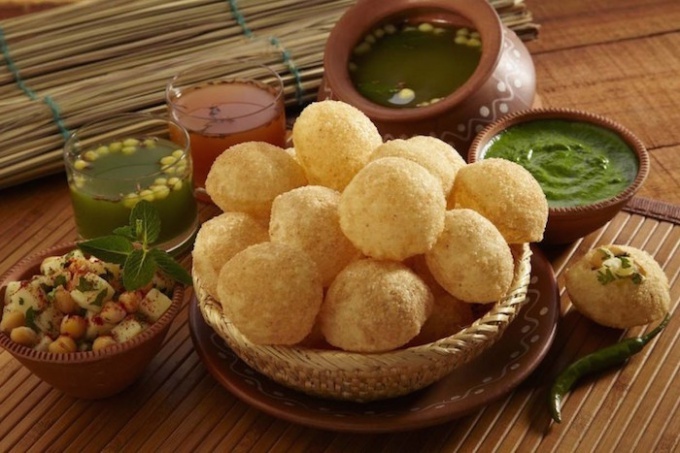 Golgappa (Golgappa, Golgape, Pani Puri) traditional Indian dish, the popularity of which is very large. Golgappa is a balls of dough, deep-fried. Variruyutsya they are, as a rule, mashed chickpeas with spices. And served with a special bitter water. I suggest to try to cook basis meals - the balls of dough in the original recipe, and the filling you can choose to your taste. - cold water 50-75 ml. Connect the semolina with the flour, stir. Add the flour a tablespoon of vegetable oil, mix thoroughly and spread the mixture with your hands. Small portions pour in the dough water (literally 10-15 ml), stirring continuously. Add enough water so that the dough retains the shape, it was very dense and not sticking to hands. Once the dough is ready, it needs to knead for about 5-7 minutes. Then put it on a plate, grab a bowl, moisten it with water and cover the dough on top. Leave on for 10-15 minutes. Pour oil for deep frying in a saucepan or other suitable vessel and place on slow fire. The oil should be very well warmed up. Roll the dough out into a thin layer (about 2 mm), it has a little Shine. During the rolling Board dusted with flour is not necessary, the dough should not stick to the rolling pin or surface. Using small cookie cutter cut out circles. Each circle lay on glass Board and once again press with a rolling pin. The thickness of the circle should be about 1 mm. And now the most important point. Take a circle of dough and dip it in hot oil. He immediately becomes the "sizzle" and float, use a slotted spoon to hold the dough submerged in the oil until until from a flat circle do not inflate the balloon. After that, you can omit the oil next circle. At the same time, you can cook 5-6 balls. Periodically turn the balls so they were evenly roasted. The finished ball has a light brown color. Catch golgappa with a slotted spoon and place on a tissue to excess oil absorbed. Cook until then, until you have used up all the dough. For stuffing and pierce the balls with one hand and put them in mashed potatoes or chickpeas. The spices in mashed potatoes add to taste. In addition, the balls you can stuff cream cheese with herbs and serve as an original snack. When forming the balls is of great importance, the thickness of the dough. Too thin or thick the dough just will not inflate. Therefore, if the ball is not formed, try experimenting with the thickness of the dough. Stuff balls just before serving. You can start balls sweet cream (chocolate or cream) and sprinkle with powdered sugar with cinnamon. You get a very delicious and beautiful dessert.